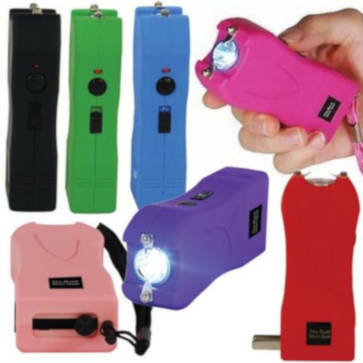 Self defense stun guns for women can disable an attacker temporarily by delivering a non lethal, high-voltage electric shock. These are perfect for smaller hands or for keeping your personal protection device a closely guarded secret. You're going to love these because of their effectiveness, size, ergonomics, and concealability. Powerful stun devices come in many colors including the very popular pink and purple varieties. They will easily fit inside of a purse, handbag or you can use the holster to take with you while jogging or walking. With high voltage reaching into the millions, ladies can now find lipstick, cellphones, and even a perfume case all bottled up with teeth clenching jolts of electricity that will give your unsuspecting attacker the most surprising shock of his life. These self defense products also make great gifts for your girlfriend, wife, or daughter by providing protection while jogging, out on a first date, traveling, or off to school.